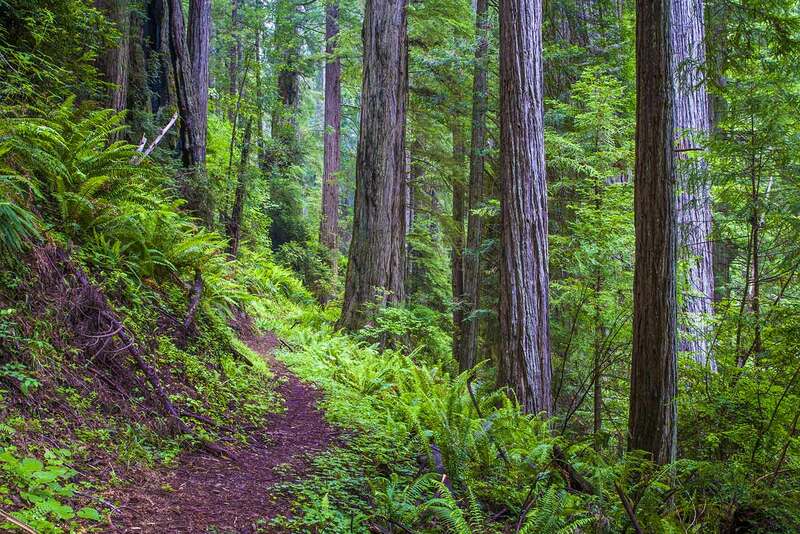 This little-used trail climbs through a spectacular redwood-filled canyon off of Drury Parkway. Although it’s very scenic, the trail is unfortunately rather short; it feels like part of a longer trail that got cut off. 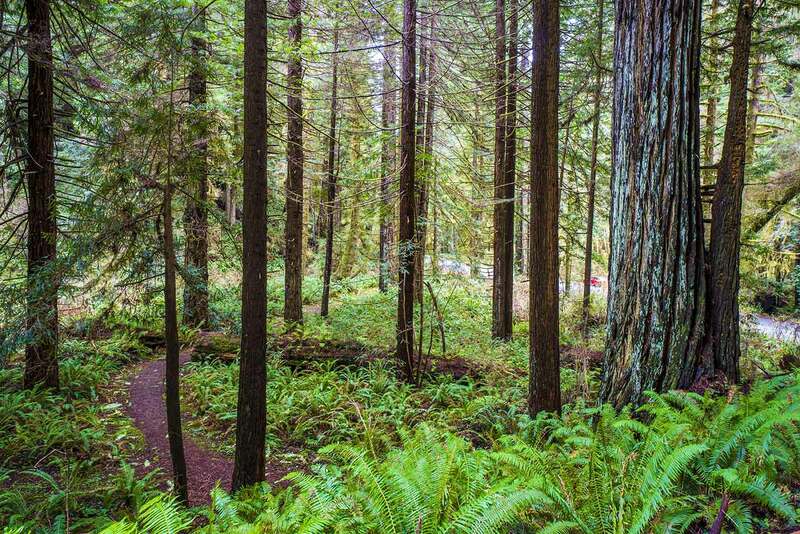 Nearby canyon-bottom trails like the Hope Creek Trail and the north end of the Rhododendron Trail are just as scenic; the Moorman–Pond Trail gets a higher rating only because it ends before it leaves the lowest and most attractive part of the canyon. 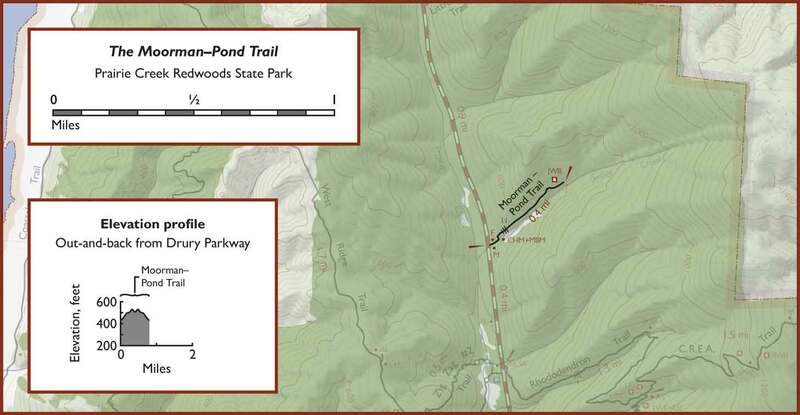 The trail is named for two dedicated groves. Start at the large Moorman Grove sign on Drury Parkway. The park hasn’t bothered to put up one of the colorful new interpretive signs at the trailhead. 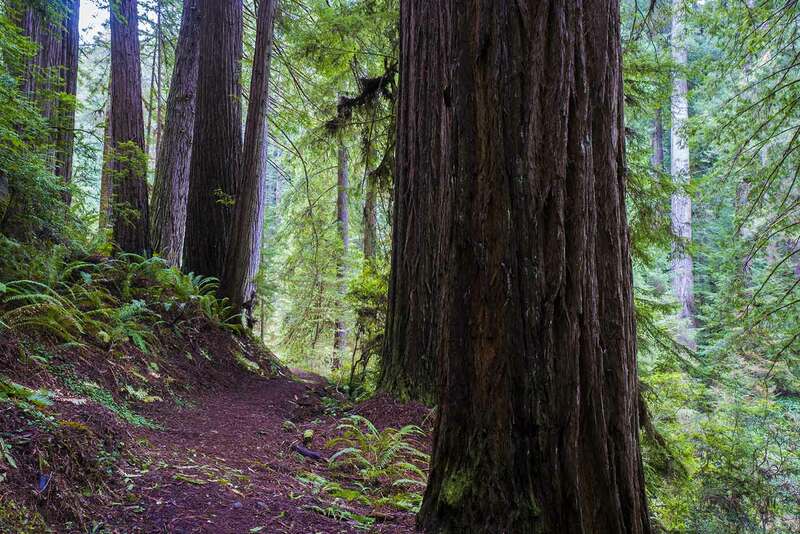 The trail briefly winds though an attractive flat, then starts to climb up through the canyon, passing through dense redwood forest with a cheerfully burbling creek below. There are some nice views of the redwoods on the opposite wall of the canyon. The trail is wide and well maintained. The trail abruptly ends; there’s no wide spot or marker at the end of the trail, just a little log across the trail. A memorial bench, now broken off from its moorings, sits by the side of the trail a few yards from the end. It’s really quite a scenic spot, though, a little redwood-lined glen, far enough from Drury Parkway that there’s no traffic noise, just the rushing of the creek. There’s no sign of any trail continuing up the canyon past this point, but a short unofficial trail to the bottom of the canyon has appeared; it just ends in a few yards without reaching anything interesting.